A quick photo I took at the Bananas Art section of the exhibition at the Private View on Monday 13 October, 2014. 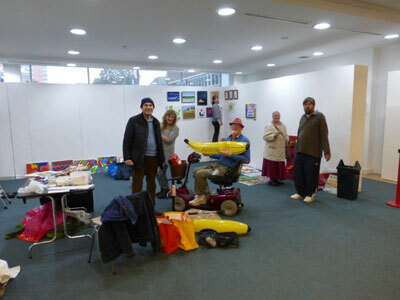 The photo below shows us getting our part of the exhibition ready earlier in the day (taken by Dave Tribe), before I dashed off to get ready for the usual Monday art group* in the afternoon in my capacity as volunteer administrator/helper. Arts Network Sutton have got some more photos from the exhibition on the ANS Facebook page, taken by Steve Broh. *If you are an adult in the Wallington/Sutton area recovering from a mental health condition and want to draw or paint in a relaxed atmosphere, you are welcome to come along. It costs £3.50 each session (which includes use of art materials plus tea and cake!). See here for more information.